Running across Rocky Mountain trails. Hiking up Vail Mountain or in Denali. Cycling through San Diego and along its beaches. Racing a marathon in New York or an Ironman in Coeur d'Alene--or better yet, Kona. I can dream about visiting these destinations as much as I want, but there's always one looming question. Where am I going to stay when I get there? Hotels can get expensive. Lodging that meets my every desire can be tough to find. A kitchen. Close to the beach or trails. Ski in-ski out. A place that's almost as good as home. I can deal with making my bed and reusing towels. And I hate begging for a mini-fridge just to keep my water bottles ice cold--I tried the cooler method once and it didn't work. Picky, I know. My requests might seem like impossible demands, but they might be more attainable than I thought. Meet Dwellable, a vacation rental website with a recently revamped iPhone/iPad app that could be the answer to many a traveling athlete's where-to-stay woes when it comes to dream destinations. I'd hardly call myself a traveling athlete. Yes, I've run marathons in California (on a BQ quest) and Boston. But most of my races are a few hours drive from home. I'm more the runner who travels, with the running happening more by accident than on purpose. Except after flipping through the Dwellable app--an entire phone battery's worth because I got lost in the pictures--I want to become a traveling athlete, a frequent one. 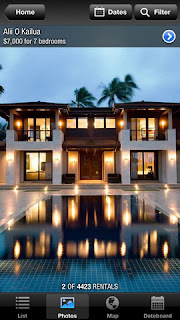 The $89 spot on Alii Drive (I'd take the 7-bedroom, $7,000 spot in Kona too, but only if I won the lottery). The cozy digs near Vail's Golden Peak. The log cabin in Alaska. The condo steps from Chicago's Mag Mile. The beachside properties on the Gulf of Mexico. A Cape Cod rental. I'm already packing my bags and getting ready to move in for a few days. Dwellable, the app, seemingly makes vacation rental searches easier. It navigates through states and major cities. It lists the rentals, at various price points, available in each locale--and even encourages property managers to add their listings in the destinations that only have a few listings. It provides contact information, detailed descriptions, and availability calendars. It features pictures, lots of them, for each listing--and those pictures sell you on the destination. You could say you're not just choosing a place to stay, but also a destination to visit. It must be Chicago's freezing cold start to spring that's making me drool over beaches in Destin, Fla. I'd rather run where it's 80 degrees than bundle up for a chilly Lakefront Trail jog. For more details about Dwellable and its new-and-improved app, check out its website or the iTunes store. Have you searched Dwellable? Do you stay at vacation rentals when you're traveling for races and active adventures? Photo grabbed from the Dwellable app.